Connected Employees: Useful or a Liability? I’m pretty active on social media sites. I figure, as a blogger, it’s my job to be. I can’t write about a conversation I don’t know about. I can’t get all sides if I don’t hear the back story from those involved. I can’t speak intelligently about topics that I haven’t been paying attention to. To me, that seems to make sense. But I wonder what employers think about this whole concept. Is the new connected employee, the one that reaches out to industry contacts via Facebook and stays in the loop during the day via Twitter, a resource for the business they work for or a time-sucking liability? It was interesting to me that so many admitted Twitter fans seemed concerned by taking on an employee who openly uses the service during core work hours. (Perhaps it’s because they’ve seen much of their own time sucked up into the application, hee.) But I think it’s a good question to consider when hiring or job hunting. 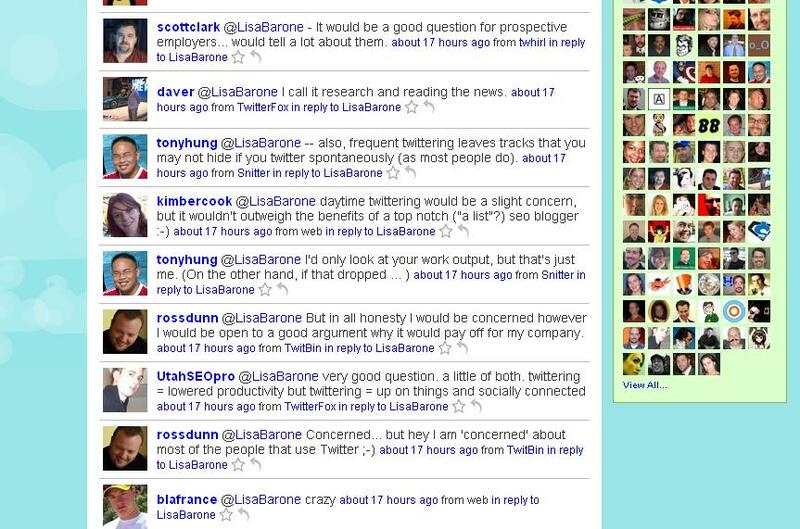 Would you hire someone who you knew used services like Twitter and would potentially use them during the work day? And as an employee, would you work for an employer who didn’t understand the benefit of these tools? Obviously, a lot of it is going to depend on the position, what the person is being hired to do, and what the corporate culture is. For example, Dave Rohrer commented that he uses Twitter for research and to read the news. And if you take note of Dave’s Twitter Link Finds posts, you see that he really does use it for those reasons. Twitter remains an excellent way to hear about a scoop before the mainstream gets it. Often news breaks on Twitter hours before you’ll see it in even the most-timely blogs. That’s powerful. It’s even more powerful if you’re hiring someone to do any type of social media or branding for your company. For these positions, having an active social media persona is vital. And part of being an active member on Twitter means participating in the conversation. You’re not going to get the scoops or build a list of contacts by sitting on the sidelines and not joining in. And you’re not going to be able to build trust if people think that all you do is talk about your own agenda. Sometimes twittering about what you had for lunch indirectly brings value to your company. To date, my use of Twitter has helped me to find out about controversial posts before they hit my RSS (especially with Bloglines’ lightning update speed), I’ve gotten offers for guest blogging, I’ve been able to help push Bruce Clay blog and newsletter content, I’ve found contributing writers for the SEO Newsletter, I’ve strengthened existing relationships, and I’ve probably increased the subscriber count for the blog. [Not to mention setting up conference meet ups, finding new resources and getting instant feedback on questions like the one that inspired this post. –Susan] Yes, when I asked that question on Twitter, it was out of curiosity, not because I had a blog post in mind. 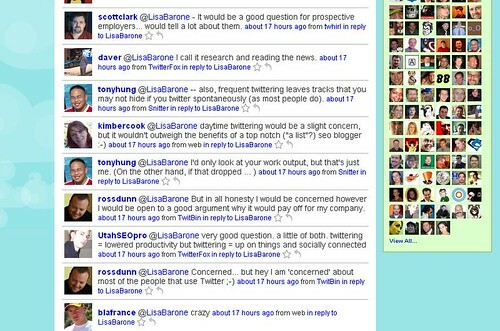 Twitter has created the concept of the virtual SEO water cooler where you can eavesdrop on conversations from all angles. Use it as a competitive research tool to learn more about what your competition is up to and what they’re working on. People drop all sorts of things on Twitter. As long as you’re just listening and not the one dropping the secret information, you’re a huge resource to your company. When I see new comments coming in on the blog and they’re coming from people I’ve "met" on Twitter, I see the value. Readers have gotten to know me on a personal level and are now more invested in the blog and Bruce Clay, Inc. as a company. And that’s the power of social media to begin with. It builds personal branding, company branding, helps you to keep in touch with customers, push new content or products, etc. I should point out that I’m also salaried. That means I am paid to complete a task and my job/day is not over until that task is completed. If the blog/newsletter/internal work isn’t finished by the end of core work hours, either am I. Do I perhaps work longer hours because I’m trying to get everything in and build our brand while also getting "real" work done? Maybe, but I think it’s worth it, both to me personally and to the company. And I think that Bruce agrees. My hope is that today’s employers are starting to wake up to the benefits of hiring socially connected employees. I know that if I was looking to fill a salaried position, a position where the person was hired to complete a task and not just paid by the hour, I would absolutely hire someone with an active Twitter account. Maybe I’m just trying to justify my own daily Twitter use, but I feel as though it’s my personal brand, my connections and my ability to reach out when needed that makes me uniquely valuable as an employee. “but I feel as though it’s my personal brand”…you see that’s the issue. A brand takes a lot of work to build and maintain, but who are you working for yourself or your clients? In your case you’re directly blogging/networking for Bruce Clay so its specifically a role requirement, so from your personal connections and success you and Bruce both benefit; but not where someone is meant to be doing other SEO/SEM related tasks. We interviewed someone once who when asked what they wanted to be enthusiastically said “a search marketing celebrity” at that point it became evident that their ‘celebrity’ came before clients success, needless to say they didn’t get the job. Time wasters are time wasters. Doesnt matter where or how, so yes I would hire them. I’m not a tweeter, but I do find myself getting dragged into other forms of social media during work hours (especially via RSS). I often feel guilty about the distractions, especially after losing myself for an hour… yet it keeps pulling me back in. While I like twitter and facebook, they are just not primary in my work life. The job I have to do doesn’t require second-to-second knowledge of changes in software development. I would frankly be concerned about executive functioning and the ability to filter, if someone I was hiring was twittering during the interview or revealed a high level of dependency. Hmmm twitter…twitter…hmmm I’ve heard that name somewhere before.